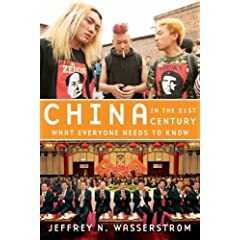 Jeffrey Wasserstrom is a Professor of History at UC Irvine, and the author, most recently, of China in the 21st Century: What Everyone Needs to Know (Oxford 2010). It is foolish to make concrete predictions about China, due to how often—and how quickly—the country has been proving people wrong. Very occasionally, though, I feel something is such a sure bet that I’m ready to go out on a limb and describe something I’m sure will occur. Here’s my latest example: in the upcoming year or two, we’ll see a lot of new general interest books on the People’s Republic of China (PRC) show up at online sites like Amazon.com and in brick and mortar bookstores. I’ll go further than this and predict that the books will be by varied kinds of authors, from freelance writers to pundits, daily journalists to scholars, like me, who often write for specialized audiences but have decided to try to reach that elusive general educated reader. And one further point, of particular relevance to readers of this site: these books, while focusing on the present, will often make at least some nods to the past, in order to place recent events into historical perspective. I feel confident about making these predictions for two main reasons. First, China continues to garner headlines, most recently ones concerning it replacing Japan as the world’s second largest economy. These naturally help keep international interest in the country’s trajectory high. Second, a large number of books of the sort I’ve just described have been published during the last couple of years—and there’s been no obvious sign of the trend tapering off. Consider what happened during the year or so between the time in early 2009 when I started writing China in the 21st Century: What Everyone Needs to Know, my latest general interest work on the PRC, and the time Oxford University Press published that short book organized around questions to commonly asked question last April. Dozens if not scores of competing texts appeared. And while many of them quickly disappeared from view, two turned out to be very high profile works: Martin Jacques’ forcefully argued When China Rules the World: The End of the Western World and the Birth of a New Global Order (Penguin 2009) and Peter Hessler’s gracefully written Country Driving: A Journey through China from Farm to Factory (HarperCollins 2010). Equally striking, to me at least, is how many new books in a similar vein have come out during the several months since mine appeared. Here’s a partial list of new titles vying for the attention of the intellectually curious and historically minded general reader: The Beijing Consensus: How China’s Authoritarian Model Will Dominate the Twenty-First Century (Basic Books, 2010) by policy analyst Stefan Halper; The Party: The Secret World of China’s Communist Rulers (HarperCollins 2010) by Financial Times reporter Richard McGregor; When a Billion Chinese Jump: How China Will Save Mankind—Or Destroy It by the Guardian’s Jonathan Watts (out in the UK from Faber and Faber, with a U.S. edition coming soon); and Playing Our Game: Why China’s Rise Doesn’t Threaten the West (Oxford University Press, 2010), an accessibly written work by MIT political scientist Edward Steinfeld<. Given the sheer volume of new general interest China books, the non-specialist may find it hard to know where to begin, and might even welcome essays that, rather than reviewing one or two specific books, divide recent publications up into categories. If this is true, they might have been glad to see or now want to know about a typically erudite essay by Perry Anderson that came out earlier this year. Called “Sinomania” and published in the London Review of Books, this piece finds Anderson divvying up recent books up into three broad groups: those that veer toward either “Sinophobia” (fear of China) or “Sinomania” (celebration of the Middle Kingdom’s rise); combine elements of both these things (he shrewdly places When China Rules the World in this group, claiming that while its title plays upon anxieties, its text often has an adulatory tone); or take a completely different approach to the world’s most populous country, breaking away from a thumbs up or thumbs down take on the country. He clearly prefers books in this final category, and he singles out for special praise one title. This is an ethnographic account of working class struggles by sociologist Ching Kwan Lee. It is called Against the Law: Labor Protests in China’s Rustbelt and Sunbelt (University of California Press, 2007), and it makes for even more relevant reading now than it did when Anderson was writing about it, in the wake of the headlines garnered by last spring’s strike wave. I stand by what I wrote in Time and continue to admire Anderson’s essay, but I’ve begun to feel, as I continue to read and review general interest books on China, that it’s worth bringing still another categorizing scheme into the mix. Namely, the “fox” versus “hedgehog” divide made famous by Isaiah Berlin. The fox, according to this breakdown (that Berlin traced back to an ancient Greek text), ranges widely and as a result comes to know many things. A worthy recent China book in a fox-like vein would be Postcards from Tomorrow Square (Vintage 2008), in which Atlantic contributor James Fallows offers up insights on everything from Internet security to Macau’s rise as a gambling hub. (My own China in the 21st Century, which looks at topics ranging from the revival of Confucianism to the 2009 riots in Xinjiang, belongs in the same category.) A hedgehog, by contrast, stays on one trail to gain a thorough understanding of a single big thing. An example of an unusually good recent hedgehog-like China book is The Last Days of Old Beijing (Walker and Co., 2008), in which Michael Meyer explores in detail the impact of urban development via changing patterns of life in a single hutong (alleyway). There are Big China Books that take a fox-like approach, covering all sorts of topics. Halper’s The Beijing Consensus, which explores various aspects of Chinese domestic politics and also examines the country’s international relations, for example. And there are bottom-up works that fall into this category, such as China Road: A Journey Into the Future of a Rising Power (Random House, 2007), in which NPR’s Rob Gifford uses a long trip down a single highway as a jumping off point for discussion of varied themes. There are also both top-down and bottom-up books that take the approach of the hedgehog. Among very recently published books, The Party and When a Billion Chinese Jump are cases in point. The former (which I’ve reviewed at length elsewhere) may address many specific aspects of Communist Party rule, but in the end McGregor comes across as much more of a hedgehog than a fox, since he makes it clear from start to finish in his top-down book that he sees this organization’s surprising longevity as the big China story to be tracked. And while When a Billion Chinese Jump is framed as a travel narrative, which brings to mind fox-like books such as Gifford’s China Road and Hessler’s Country Driving, Watts parts company with those writers by focusing on the environment as the crucial issue relating to the PRC. His travels, as he notes, were orchestrated to help him meet as many people as possible with stories to tell that would shed light on Chinese experiments with green technology, the impact growth is having on the land and waterways of the PRC, and global warming. Whether one prefers spending time with a fox or a hedgehog will often end up being a matter of taste, but for me determining whether a general interest China book by either kind of author succeeds or fails comes down to two questions. Does it hold my attention? And does it provide insights that could not be gained via something other than a book? And by these metrics, I’m afraid, I find The Beijing Consensus a complete failure, due to its repetitiveness, its lack of flair, and the fact that, despite all the issues it brings up, the sum total of new information it contains would fit easily into a single Foreign Affairs essay. The Party and When a Billion Chinese Jump, on the other hand, are good examples of successful new books. Each is by a hedgehog of an author, while I tend to be more fox-like myself when writing for general audiences. Still, as a reader, I often appreciate the tightly focused books produced by hedgehogs. As long as they have a knack, as McGregor and Watts both do, for writing with verve. And realize that, while they may be passionate about the importance of a single subject, the best way to convey this to a reader is to keep coming at it from new angles and providing fresh evidence (in the form of everything from statistics to illustrative life stories) that shows why the topic matters.